Excellent products. Large inventory to choose from. Great! Very pleased with how this frame enhances the photo. Great quality. Perfect fit. Definitely one warmer side of gold, antiqued finish. Exactly what I wanted. I expected the frame to be GOLD as shown and advertised. The frame appeared to be closer to a copper (definite reddish tone). If I hadn't needed the frame for presentation to a customer I would have gone to the trouble of returning it. Hello Jim. Thank you for placing an order with us. We apologize that the gold finish on the frame was not what you were expecting. We do our very best to capture the true essence of each frame in the photography. Our return process is very simple and easy if you would like to return the frame at this point. Otherwise, we are glad to give you a company credit as a courtesy. We look forward to making this right with you. We can be reached at 1-800-332-8884. Have a great day! It is suitable for an oil painting of an old sea captain. I've dealt with Graphic Dimensions for many years. They have a wide choice of styles and their products and services are professional every time. It works well with the other artwork in my house and I anticipate it looking great with the cross stitch I will be putting in it. I've shopped this site numerous times before so I know they have excellent quality and service. 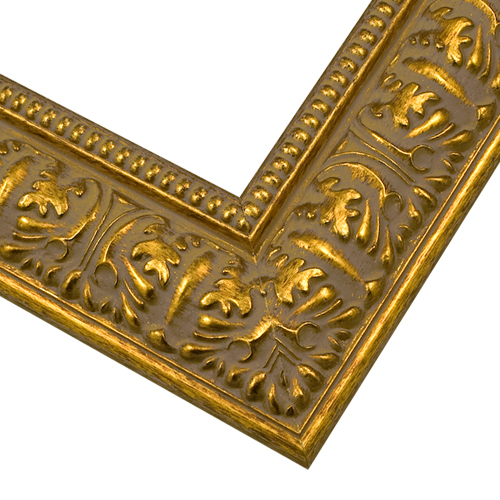 This particular frame is for an oil painting of red roses and the gold complements the red. I wanted some movement in the frame to pick up the movement in the painting -- but not so much that the frame overwhelms the painting. This frame is perfect for what I'm trying to accomplish. The piece of fine art to be mounted needed either a light or medium gold frame to enhance and not overwhelm it. I felt this particular frame added both richness and depth to the painting. The picture has "sample picture" where artwork should be, can I upload my art to see a preview? BEST ANSWER: Hello John! 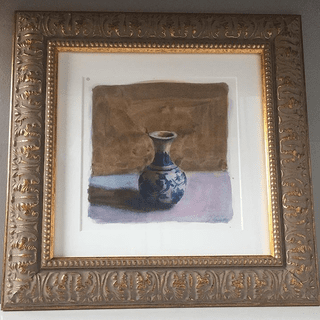 You may absolutely preview your artwork in the frames. Please hoover your mouse over 'Upload Print and Frame' then look under 'Frame only no Print' and click 'Preview, upload, and frame. Happy Framing!